A Sermon on the Freedom and Happiness of the United States of America, Preached in Carlisle, on the 5th Oct. 1794. Philadelphia: Printed by Samuel H. Smith for Robert Campbell, 1794. In September 1794, the town of Carlisle, Pennsylvania was the initial rendezvous point for more than 12,000 militiamen drawn from New Jersey, Maryland, and Pennsylvania. The United States government was assembling this force to put down the first serious resistance to federal law since the ratification of the Constitution. This rising is now known as the Whiskey Rebellion, a popular western opposition to the collection of a new federal tax on distilled spirits, levied in 1791. Resistance on the frontier of most western states was particularly strong for several reasons. Residents already complained about a perceived lack of federal and state protection from frontier hazards such as Indians and British encroachment. Added to this were the land policies of several states that parceled out already settled land to absentee landlords - including George Washington. The tax itself was weighted against small distillers to the advantage of larger concerns, and to top off all other grumbles, it was payable in cash, an inconvenient arrangement in the largely barter economies of the west. When the tax commenced, so did unrest. In Washington and Allegheny Counties of western Pennsylvania, tax collectors were threatened, attacked and expelled. Ill feeling led to democratic demonstrations as far to the east as Carlisle. Matters worsened through the following months; reports came in early 1794 that representatives had been elected and an insurgent army 6,000 strong assembled in the area around Pittsburgh. On August 4, 1794, James Wilson, a former resident of Carlisle and an associate Supreme Court justice, made the legal ruling that the western area was so opposed to government that usual means were no longer sufficient. Three days later President Washington issued a proclamation that called up the militia, declared the insurrection illegal, and gave an ultimatum that order must be restored by the first of the next month or federal force would be used. Much to the relief of the wealthier citizens of Carlisle, the federalized militia began to assemble in Carlisle in the last week in September, 1794. The town had seen boisterous, but mostly peaceful, demonstrations against the tax; some prominent men in town had been burned in effigy and a liberty pole had been erected and defended enthusiastically. When the troops -- including the prosperous volunteers from the Philadelphia and Lancaster Light Horse -- arrived, two local men were killed accidentally. By the time General Washington and General Alexander Hamilton came to Carlisle in early October, however, the streets were peaceful. On October 5, 1794, the prestigious visitors attended services at the Presbyterian Church on the town square. The pastor, Robert Davidson, was also the vice-principal of the eleven year old local college named for John Dickinson. 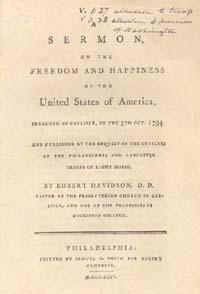 His sermon that day was later published in Philadelphia under the title On the Freedom and Happiness of the United States of America at the request of some of the Light Horse officers also present. Davidson begins with an assertion that public concerns and the gospel cannot be separated, especially in times like the current "crisis." He takess for his text the passage from Samuel in which God reassures David of his blessing, and the warrior king replies with the words "And what one Nation in the Earth is like thy People, even like Israel." He goes on to lay out the history of the "Jewish nation" as proof that Providence guides events rather than chance, and that the Jews were indeed a "chosen people." Davidson, naturally, finds parallels with his United States; in the sanctuary of the New World, the new settlements were pre-destined to become a great republic. Now, he asks again, "what Nation on Earth is like the American people?" America had supreme advantage to be able to choose all that was good in previous human experience, and to leave the bad; it had chosen freedom, equality, justice, and freedom of religion. He praises the administration for its efforts to keep the country from being dragged into a European war of no concern to the United States. He then comments at length on the current troubles, noting that he is surrounded by soldiers who are here not to invade but "to teach those who will not otherwise be taught that we ought all to be obedient to lawful authorities." He praises the "citizen-soldiers" who have come to do this, noting that wealthy men are presently sleeping in camp straw in the cause of liberty. He ends his sermon with fulsome praise for the commander-in-chief (that Davidson said later would have been more strident had Washington not himself been present). Davidson's sermon on this historic Sunday can be seen to point to the essential role of economic status in the events of 1794. Clearly, his definition of liberty and that of his listeners was not the same as those who had erected the liberty pole just weeks before a few yards away. His words echo clearly the desires of his class for tranquility, prosperity, order, and freedom from foreign entanglements. They also reinforce the idea that was finding its way into American culture that the new nation was indeed the new "chosen people" of God. The Whiskey Rebellion collapsed within weeks. Washington had shrewdly sent U.S. Commissioners to treat with the rebels as his troops gathered. With an Indian war underway, another conflict possible with Spain, troublesome French activities to the south, and revolutionary fervor reaching America from Paris, he could ill afford a civil conflict over taxes. The western assembly agreed to capitulate before the main body of troops had reached Pittsburgh, and the primacy of the new federal constitution had met its first test. Ringleaders in Washington County were arrested, and 150 men were transported back to Philadelphia for trial. After a respectable time had passed, Washington pardoned all involved on July 10, 1795. In 1802, President Thomas Jefferson repealed the Excise Tax.